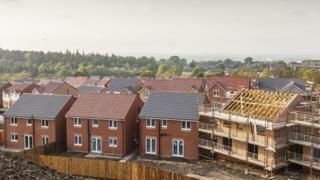 The number of new homes being built in England is at its highest level for ten years, according to government figures. The Department of Communities and Local Government (DCLG) said 162,880 homes were started in 2016/17, with 147,960 completed. Both numbers represent the highest number of new builds since the start of the financial crisis in 2007/08. However, housing charity Shelter said the numbers were still about 100,000 short of what was needed. "While it's certainly positive to see a rise in house-building, we should be under no illusion that these figures are still pitifully low," said Anne Baxendale of Shelter. "Even with this slight lift, we're still falling well short of the 250,000 homes a year we need to ease the burden of the housing crisis." The Mortgage Advice Bureau said the fact that the Help to Buy equity loan scheme was due to end in 2021 could already be discouraging developers from buying land. The latest figures on Scottish house-building show that 16,870 new homes were built in the year to September 2016, a decline of 5% on the previous year. Back in 1972/73 more than 300,000 homes were constructed in England in a single year. How can the UK build more homes? The vast majority of new homes started - about 137,000 - were built by the private sector. Some 23,000 were constructed by housing associations, and 1,730 by local authorities directly. How can the UK build more homes post-Brexit?